To start, the titanium dioxide layer is compounded by sintering TiO2 nanoparticles at a temperature range of 300C to 500C. The sintering process takes place on the transparent conductive oxide (TCO) glass plate, which is put into a uniformly heated furnace for about twenty minutes. This process omits the ambient moisture within the Titania layer, which is needed to ensure the electrical contact between the titanium dioxide nanoparticles and a worthy adhesion to the TCO (transparent conductive oxide) glass plate. Sintering of the layer can be executed at 150C, however, its performance power will be lower than those sintered at 450C (mentioned in P.M. Sommeling research paper; ECN Solar Energy). The layer is then soaked in the dye solution so that the dyes can be absorbed into the TiO2 surfaces. Finally, the layer is inserted into a drying furnace where the titania is baked at 100C, and then sanctioned for cooling. Extensive research has been accumulated on the effects of various temperatures and the efficiency of the DSSC. The current ideal firing temperature is preferred around 450-500 C. High sintering temperatures at 450C result in a more desirable contact between the nanoparticles and a stronger adhesion to the substrate than those sintered at lower temperatures. It is important to keep in mind, however, that the DSSC will become unstable at very high temperatures because they have an upper limit of 600C to 650C. 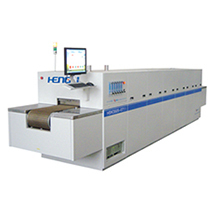 The HSK series furnace is an energy efficient precision thermal processing system specifically designed, and most often used, for DSSC applications. It has six channel temperature profiling units for independent temperature profiling with an LCD data display and check, analysis software, sampling unit, 3 T.C., and an RS232 CPU interface. The HSK Series is designed to support continuous on/off heating and cooling cycles resulting from alternating production periods and inactive operation. The heating length of the HSK Series is 3220mm (127") and includes seven independently controlled heat zones. Process materials are transported through the furnace on a belt that is 350mm (14") in length with 50mm (2") of product clearance. The speed of the belt ranges from 40-200mm (2"-8") per minute and is administered using a digitally displayed variable frequency motor controller. The belt speed is also programmable in IPM with readout right on the PC. The belt material on the HSK Series furnace is Nichrome V mesh (Balanced Spiral) and operates from 480V, 3 phase, 5 wire, 60Hz with a maximum load connection of 42kVA. The performance of the HSK Series furnace is unparalleled as it can protect itself from over heating, over loading, and low gas pressure. It has an ultra-clean low-mass refractory heating chamber that can increase heat from ambient temperature to 1,050C in approximately 40 minutes. The temperature of the furnace is controlled by a microprocessor that typically operates from 200-900C. Each zone is managed using a high performance, single ASIC full auto-tuning PID and a single loop intelligent temperature controller. The HSK Series atmosphere distribution and management system can terminate thermal shock and process contamination, as well as, extract burn-off effluents across the entire width of the chamber for yield improvement. The HSK Series is assembled with entrance/exit curtains and an air powered Venturi exhauster (200mm /8" in diameter) to keep the firing chamber clean while, at the same time, improving temperature stability for drying and firing. The exhaust flow can also be easily adjusted using the flow meter. The HSK Series is readied with a redundant overheating safety protection system that incorporates a K type thermocouple (located in the center of each heated zone) and a multi-loop alarm. It ensures consistent firing results because of its exceptionally reliable temperature uniformity control. The HSK Series furnace has a removable condensate collection trap and provides emergency off buttons located at each end of the furnace (connected to a 24V emergency off circuit). To see a complete list of the HSK Series specifications please see the chart below. Heating Length 2160mm/85" 3220mm/127" 3220mm/127"
Cooling Length 1200mm/47" 1200mm/47" 1200mm/47"
Overall System Width 1040mm/41" 1100mm/43" 1400mm/55"
Overall System Length 5800mm/228" 7000mm/276" 7000mm/276"